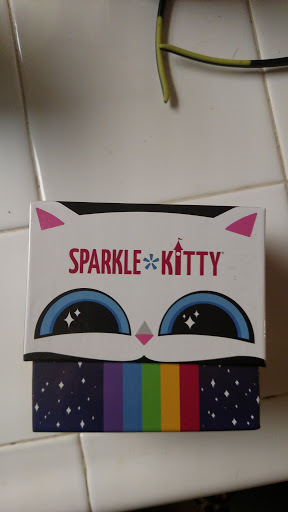 In Sparkle*Kitty you play the role of a princess who has been captured by the evil Sparkle Kitty and placed inside a cursed “No Cursing” tower. Rather than sitting around and waiting for rescue you must take matters into your own hands and turn the sweet words into mighty spells to tear down the tower and escape. 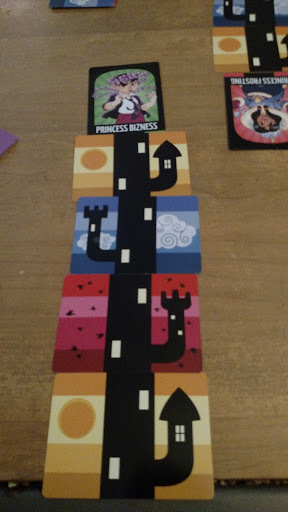 To begin the game each player gets cards and randomly selects 4 of them to build their tower then places their princess card at the top taking the rest of the cards as their hand. Players then take turns playing cards matching color or symbol onto the spell book in the middle of the table saying the spell created out loud. 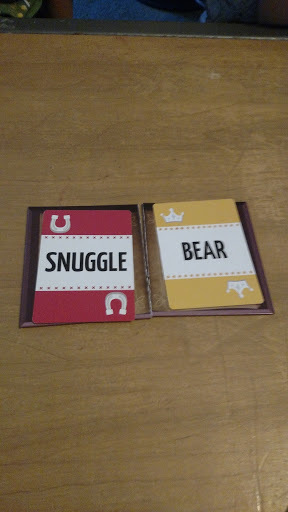 This often leads to interesting and humorous combinations such as “Jiggle Panda” or Snuggle Bear”. 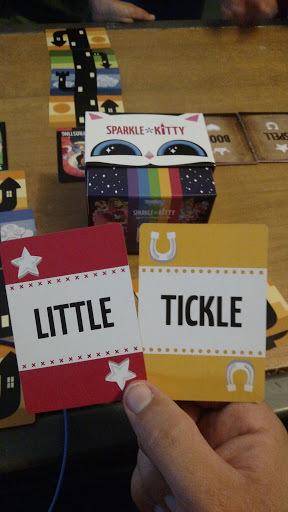 There are 3 ways to remove cards from your tower, by getting rid of all of the cards in your hand, double plays (playing the same card on top of one that has just been played), and with special Sparkle or Kitty cards. To help you in your task there are a handful of special cards with their own special abilities. 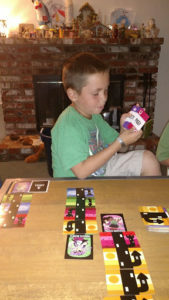 The game is fast paced and the silly spell combinations bring a lot of laughs to the table making us want to play the game immediately after finishing a round. I love this game! 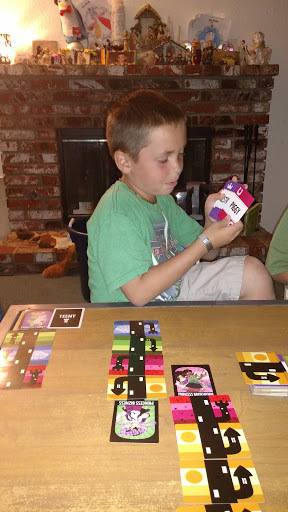 I liked placing the black cards allowing you to place a card onto someone else’s tower making it larger and keeping them from winning (Note: he did this a LOT…who shuffled these cards?). 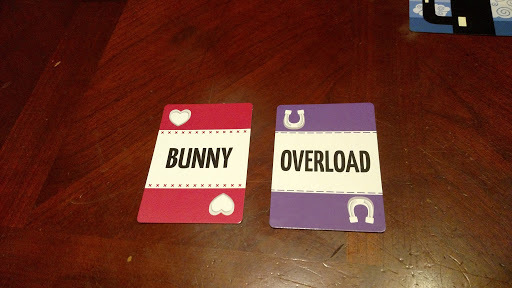 I liked being able to match the colors or symbols which allowed more options for cards to play. 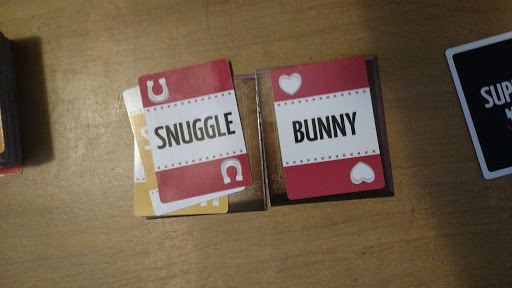 The phrases made in the game were really funny and were a lot of fun to say. 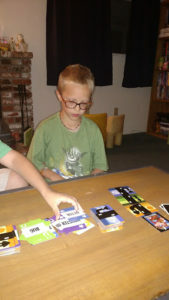 I liked the special ‘rainbow’ cards that had special abilities luke “Fudge” that was a lot of fun. I liked playing the black cards because they made you say that word each turn like “Perfect Fudge Kitty”. 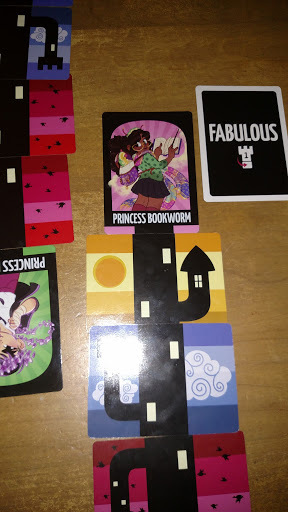 I spent most of the game laughing too hard at the phrases we were making that sometimes it was hard to play.